IgG1 proteolytic cleavage by the papain gives two Fab fragments and a Fc (Fragment cristallizable) fragment. 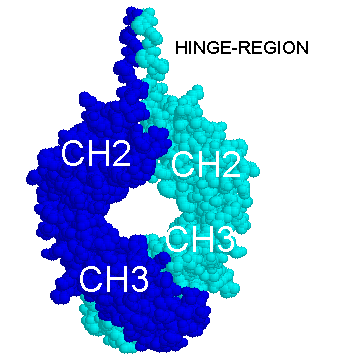 Fc fragment is composed of two identical, disulfide-linked peptides containing the heavy chain CH2 and CH3 domains. The corresponding PDB (Protein Data Bank) format file is from Mike's immunoglobulin structure function site (http://www.umass.edu/microbio/rasmol/padlan.htm).